actually getting to stamp and loving how it turns out! Yes, it seems like awhile since I've been able to just sit and stamp and get a card completed in that one sitting. Of course, this card was created for this week's SCS CAS Challenge. Click HERE to see the challenge/rules. CAS stands for Clean & Simple and that is what this card is...simple! This week was an inspiration challenge. I chose this beach towel for my inspiration. Can you see the resemblance? It also inspired me to pull out a long neglected stamp set, Pick A Petal. I have always had a difficult time using this set. I started with the Green Galore base, which I still had on my desk from this post. 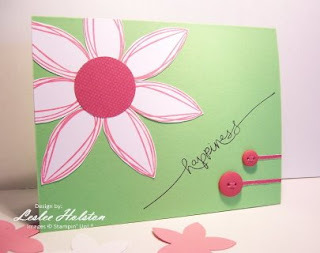 I stamped the outlined petal in Regal Rose on scraps of Whisper White and cut around each petal. This really took no time at all. I punched a 1-1/4" circle from some Raspberry Tart Designer Series Paper (this will be retiring) and applied it center of the petals. 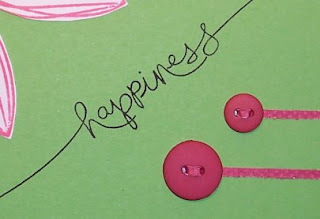 The 'Happiness' sentiment is from Heard From the Heart set. I simply markered the word in Basic Black and used my Stamp-A-Ma-Jig to get exact placement. The lower corner was left a bit bare, so I added the two buttons. Note the button treatment. I had read somewhere that no button should go naked. I find that is a matter of personal preference. I had also read somewhere to use a thin strip of paper to thread through your button holes. Well, I just so happened to have a strip of scrap on my desk (same DSP as the flower center). I thread it through the holes and left the tails to run off the side of the card. It fills up that bare space very nicely. I like the look! Let me know what you think. On a personal note, my grandmother gets to return home today. After spending 3 months in a rehab facility, she gets to go home! Congrats to grandma K! I think I'll send this card to her! See, inspiration really can be found everywhere! Thanks for stopping by today. I hope you've been inspired.